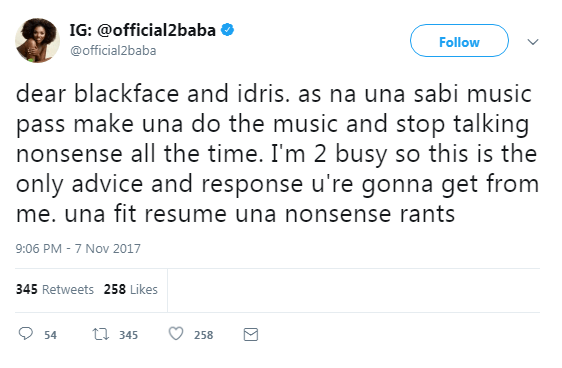 Legendary music icon, 2face is responding to Blackface interview on Pulseng’s ‘Loose Talk’ where he criticised his lyrics and generally the watery lyrics of Nigerian musician. dear blackface and idris. as na una sabi music pass make una do the music and stop talking nonsense all the time. I’m 2 busy so this is the only advice and response u’re gonna get from me. una fit resume una nonsense rants’.